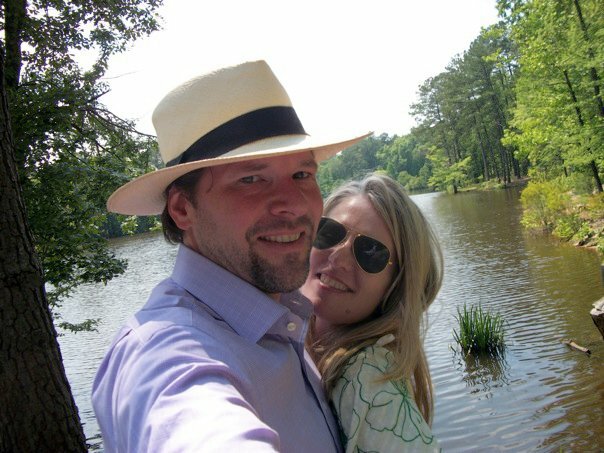 A couple of weeks ago, we did the big pilgrimage to Augusta to see David’s parents for Mother’s Day. Although he’s been to Birmingham on several occasions to meet my folks, I had yet to meet his; and to be honest, although I was really excited to finally meet them, I was a little nervous, too. Not that I had any concerns about them being awesome – his mom and I were already FB friends, so I’d interacted with her a lot to this point and found her to be incredibly sharp, funny and sweet. My biggest worry was in making a good impression on them, after all, I hadn’t met anyone’s parents since oh, say, the Reagan administration, so my parental etiquette skills had to have some serious rust. David is very close to his family, so I felt there was a lot riding on this. Of course, my fears were groundless (or they covered well), and because they were so truly warm and welcoming, I got over my angst pretty fast and had a marvelous time. We arrived around 5 p.m. that Saturday, just in time for the TV airing of the Kentucky Derby. 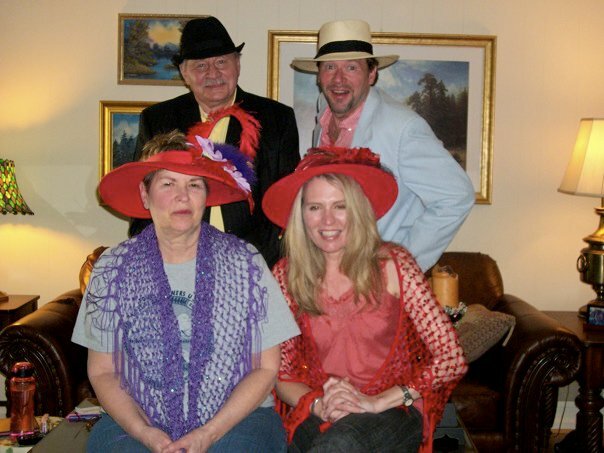 David’s parents were quick to get into the spirit, grabbing an assortment of hats (de rigeur for Derby watching) while I mixed up some Mint Juleps for the guys. To highball glass or silver Julep cup, add minted simple syrup, then 1 cup crushed ice, bourbon, and splash of water. Add enough of remaining ice to almost fill glass. 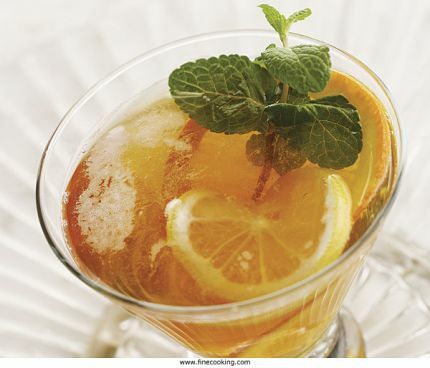 Stir well and garnish with mint sprig. Naturally, David had a special dinner planned for us; so after the races, he got to work on the grill, building the coals and whipping up all the ingredients for his famous Grilled Leg of Lamb with Chimichurri, something he learned to make during his many travels to Buenos Aires. I’m not a big lamb fan, as a rule, but there was so much hype around this, I put on my big girl pants and braved up for yet another culinary adventure. Let lamb come to room temperature. Open flat with inside facing up. a thin layer of oil). Liberally coat with course cracked pepper corns. over and near parallel with coals but not directly on top of entire mound. internal temp reads 130 degrees. Can make the chimichurri up to 3 days in advance. Wow, the lamb was spectacular! 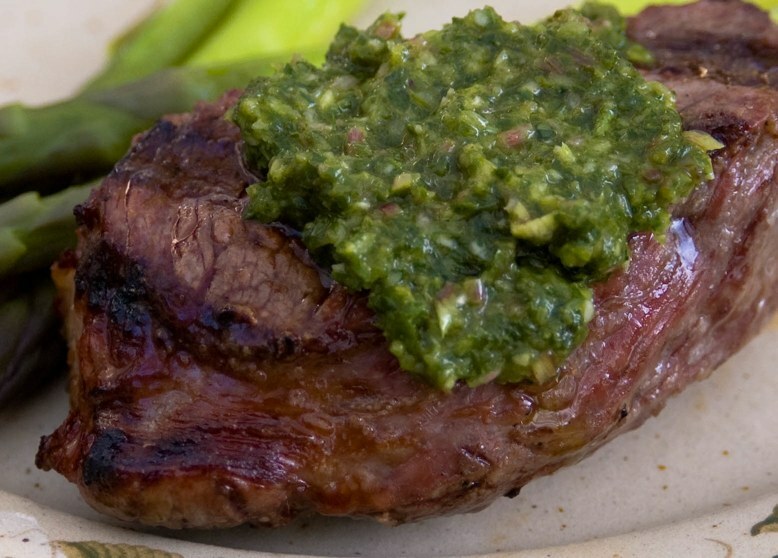 None of the gamey taste I always associate with lamb, and perfectly cooked with a nice char on the edges, contrasting perfectly with the cool, vinegary chimichurri sauce. Delicious. Will definitely be on my request list for future grilling (Note to David: Lamb is noms). After dinner, the Strohmans entertained me with several original productions (read: family flicks) featuring David as a teen-aged movie star, which were, of course, not only massively enjoyable to watch (heh), but gave me some wicked amo for future boyfriend mental abuse. I even got to meet one of his sisters, Vicky, who came by the next morning with her family for Mother’s Day breakfast. What a bunch of really gorgeous, incredibly well-mannered kids! We sat out on the patio enjoying the sun, while the young’uns dashed around chasing bugs and playing with Max, the Golden Retriever, who kept jumping in the pool to attack the cleaning robot. Pretty funny stuff, but you’d probably have had to have been there. David and I even managed to cut out for a few minutes and walk down to the neighborhood lake, before heading back to the house to pack up. 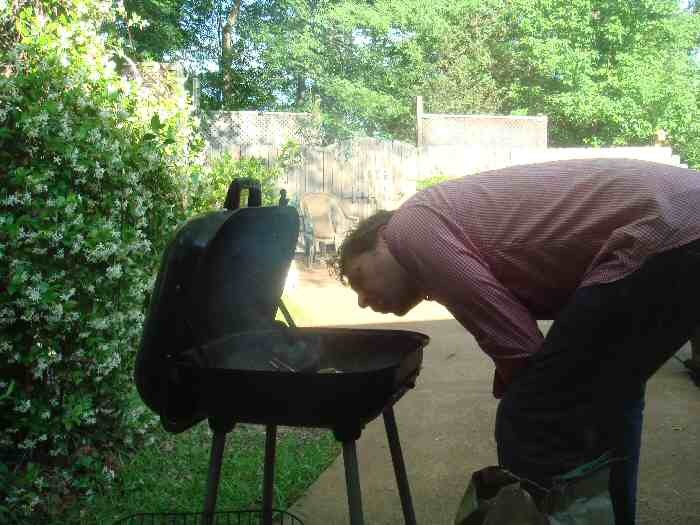 This entry was posted in Uncategorized and tagged bbq, cooking, entertainment, food, grilling, Kentucky Derby. Bookmark the permalink. And you did not leave one thing. That’s a plus! Well,except good thoughts and we can’t wait till you come again! So glad you had a nice time Kim, although I knew you would. Yup…my parents are the greatest! I’m so jealous Vicky got to meet you! Aren’t her kids amazing? Well, she’s an amazing woman, so it only stands to reason her children would be too. I can’t wait to finally meet you too!